Doris Dörrie’s novel, Where Do We Go From Here?, published in English in 2002 by Bloomsbury U.S.A., first caught my attention because a chapter from this novel appears as a stand alone short story in Wisdom Publication’s first Buddhist fiction short story anthology, Nixon Under the Bodhi Tree and Other Works of Buddhist Fiction. In this anthology, the chapter does not provide a name for the narrator and main character, so I was extremely curious to find out more about the larger story. 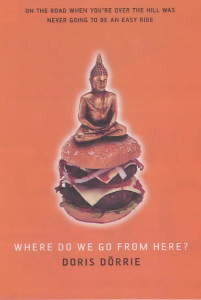 Since purchasing the whole novel and seeing the cover, I think I would have picked up the book based on the picture of a Buddha sitting atop a burger. Now every time I look at the book I think of the blog the worst horse, home of the dharma burger. But I digress. I have to give credit to Dörrie for writing an entire novel with such an unlikeable protagonist yet managing to keep me engaged. Usually I can find some form of empathy with a protagonist but I had difficulty in this area with Fred. I think I kept reading because I wanted to see what happened next in Fred’s adventure, and because I like the way that Dörrie rendered all of the other characters, who seemed to have sense enough to leave Fred to work his way through his own mid-life crisis. One of my favorite parts of the book is a moment of clarity Fred experiences at the meditation retreat. After complaining about meditating, about the conditions of his surroundings, and about life in general, Fred finally starts to settle and has what Oprah would call an “aha” moment. During meditation he sees a blackbird hopping around outside of the meditation tent, and he suddenly hears the dawn chorus. . .
“I hear it as if I’d only just been equipped with ears. I don’t know anything about birds, so I can’t identify them, but I hear them not in the usual way, as an incidental twittering sound, but as a unique occurrence unrepeatable in this particular form. This dawn chorus will only occur once—now, this very moment—and if I don’t hear it now I’ll never hear it again. I’ll have missed it once and for all. Euphoric as this realization makes me feel, I’m simultaneously shattered because it means I’m forever missing my own, unique life—because I’m blind and deaf” (p. 138). After reading the description of this small mindful moment, I was hopeful that perhaps Fred’s metaphorical blindness and deafness would disappear and he would remember to keep his eyes and ears open, to try to be present in the moment not only for himself but for the people who still, miraculously, care for him. Then I finished reading the novel and was left wondering if Fred learned anything at all. I won’t spoil the ending for those who want to read the book, suffice to say that it is modern and open (no closure here by a long shot). So did Fred learn anything from his moment of mindfulness? Clearly Dörrie’s novel is fiction, but can it be labeled “Buddhist” and if so, in what sense? Why? If there are other readers of this novel out there who would care to share their thoughts on this novel and more specifically these questions, I would really appreciate your comments! Can There Be Such a Thing As Buddhist Fiction? When I start explaining to friends, family and acquaintances the locus of my dissertation project, Buddhist Fiction, I get a lot of interesting responses: blank stares; gracious smiles and nods followed by a quick change of topic; and a reaction range from polite curiosity to not-so-polite dismissal at the very thought that precious time could be wasted on fiction when Buddhist practice is so squarely focused on reality. To be fair, most people have never heard of this emerging sub-genre of popular literature, so I have come to expect such responses. Still, I continually question, and get the question, can there be such as thing as “Buddhist fiction”? After learning of the genre label Buddhist fiction I began to search everywhere for it. When I found the first short story anthology of Buddhist fiction, Nixon Under the Bodhi Tree and Other Works of Buddhist Fiction (Wisdom Publications, 2004), I hoped for some sort of guidance or illumination from the opening portions of the book. The collection was edited by former Buddhist nun and fiction author Kate Wheeler who says early in the intro, in a somewhat tongue-in-cheeky way, that “You can’t just lump Buddhism and fiction together, and start talking about “Buddhist fiction.” I want to take my royal seat as the editor of the world’s first anthology of “Buddhist fiction” and say there is no such thing, or at least that “Buddhist fiction” is a rather strange and impossible category.” I was off to a bumpy start. In this introduction Wheeler also discusses the danger of words and the juxtaposition of fiction with the real that inevitably comes up when faced with the phrase “Buddhist fiction.” She leads her reader through a history of her thinking about this sub-genre and how it could and could not be delineated. She talks of Buddhist fiction as a form of writing that “dramatizes the dharma.” Eventually Wheeler turns to her job as editor and relates that she agreed to take on the editing project “with the stipulation that we would not define what the nature of the Buddhist connection [in the short stories] had to be. Rather, we’d leave that to the writers, and they didn’t have to identify themselves as Buddhists” (my parentheses). 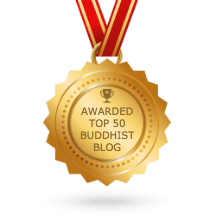 So if someone is a Buddhist practitioner who writes fiction it does not necessarily follow that their short stories or novels would fall into the category of Buddhist fiction. For a bit more on this, see Daniel Burke’s November 23rd, 2007 article in the Salt Lake Tribune entitled “A Bevy of Buddhist Fiction Writers” (recounted here on the Buddhist Channel) Herein, Burke interviews celebrated author and Buddhist George Saunders, who recounts to Burke that while he “believes his religion and his work are inseparable, he’s not inclined to pen any Karma-lized junk food. ‘I wouldn’t write a story where a guy has an identifiable Buddhist thought. '” And here is the heart of the matter – identity. If author identification as a Buddhist and a fiction writer does not help delineate the genre-category Buddhist fiction then how did Wheeler choose which stories to include in the first short story anthology of Buddhist Fiction? She states that the main criterion she rigorously applied was that every story be satisfying. I like her use of this word, as it seems to me a solid translation of sukkha, the opposite of dukkha or unsatisfactoriness, dis-ease, or suffering (which in my humble opinion is not the best translation of the term dukkha).